In his prologue (“Das Vorspiel”), Erik Larson writes, “There are no heroes here, at least not of the Schindler’s List variety, but there are glimmers of heroism.” What heroism did you find in this history? Who were the greatest cowards? Discuss the significance of the title, derived from a literal translation of the word Tiergarten. What is captured in the deceptive beauty of the garden, a refuge for many of the men and women described in the book? What does it take to transform a beautiful creature into a “beast”? How was Martha able to appear youthful, even virginal, yet also sophisticated? What made her attractive to such a broad variety of men, from literary figures to military leaders? What type of man was she most attracted to? How did these men compare to her father? Studying for his doctorate thesis in Leipzig, Dodd researched American history while he was a student far from his homeland. Returning to Germany decades later, what did he discover about his homeland by looking at it as an outsider? Larson describes Roosevelt’s struggle when no one would take the job as U.S. ambassador to Germany. Would you have accepted the job if you had been in Dodd’s situation? Was Dodd’s lack of wealth a help or a hindrance as an ambassador, especially in a time of economic depression? Would Hitler have been more intimidated by an American ambassador who lived lavishly? Dodd was repeatedly reminded that his big-gest concern should be whether Germany would default on its massive debt to the United States. Why didn’t Washington link Messersmith’s warnings to America’s economic interests? Do economic concerns still overshadow human rights in foreign policy today? Are economics and human rights dependent on each other? William Dodd longed to have time to write a complete history of the rise and fall of America’s Old South, the land of his ancestors. He also became embroiled in controversy when he taught at Randolph-Macon College and tried to expose unsavory aspects of the Confederacy. How did his specialization in Southern history ironically help him navigate Hitler’s Germany? 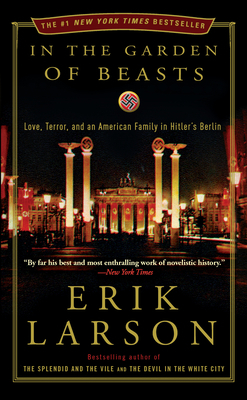 In the Garden of Beasts captures the years when outsiders refused to believe Hitler was any-thing more than a passing sideshow. Dodd even sympathized with Hitler’s belief that the Versailles Treaty gave Germany a raw deal, and that American banks were charging Germany unfair interest rates. Without the benefit of hindsight, what would you have believed about the political situation in Germany in the early 1930s? How was it possible for Dodd and Messersmith to have such different perceptions of the same circumstances? Discuss Martha’s relationship with Boris. What allure did the Soviet Union have for her? Why was she drawn to travel there? Discuss the Dodds’ evolving attitudes toward Jews. Would you have hesitated to protect the Panofsky family (the Dodds’ landlords)? What was the effect of the power struggles within Hitler’s regime? How did paranoia both help and hinder Hitler’s cause? Larson’s research sources comprise more than forty pages. Look through this section and make observations about the process he undertook to reconstruct this history. How does it benefit a society to have free access to historical documents? Is there such a thing as “historical truth”?